I had the opportunity to see “Shiro’s Head” at the Louis Vuitton Hawaii International Film Festival in October and was truly awestruck. The indie film was powerfully executed by first-time filmmakers Don and Kel Muna who took a chance on themselves and were able to create “Shiro’s Head” from meager resources. And not only do I thank them for doing so, but I feel indebted to them because their film was the catalyst to bring the Hawaiian Chamorro community together for a sold-out show miles away from Guam. The feeling in the air was just an unreal high as this was not just a movie – but Guam’s first feature-length film produced, written and directed by indigenous islanders from Guam WHO JUST PUT THEMSELVES OUT THERE AND DID IT. The sense of a Guam community was so highly present and felt like a long overdue reunion even if for just a couple of hours. The storyline – from beginning to end – was enough to leave you with a profound feeling of lost opportunities and regret and to get you thinking about your own life experiences. Although the violence was heavy at times, it did serve a purpose to deliver the true message. Not once was its meaning just handed it to me (as a viewer) on a silver platter, though – ready to consume. No – I had to earn my way through the film as I’m sure most of the viewers did as well. For those that didn’t get it might need a couple more go-arounds. For those that did – we got it and understood it well. We couldn’t stop analyzing it once we made it into the lobby after the show! From its beauty and beat-up aesthetics to the underlying themes that a film school class lecture would have a field-day with, this big movie on a small budget has earned a true fan in me. I applaud the Muna Bros. for their pioneering, heartfelt efforts in creating a film project that Guam (and myself as a Chamorro) can not only be proud of, but can embrace for generations to come. ps. 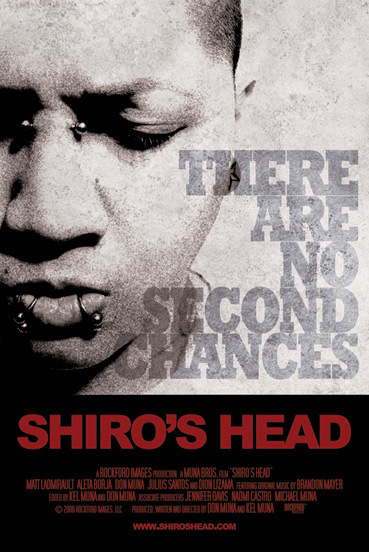 If anyone knows where I can get a DVD of “Shiro’s Head” please post it here! Thank you. Buenas yan Hafa Adai, Terrence! The Muna Bros. just released “Shiro’s Head” on DVD last Tuesday. The DVD’s are being sold at both Bestseller Bookstore locations (GPO and the Micronesia Mall) and JB’s Ukulele Hut in the Hagatna Shopping Center on Guam. I already got 4 copies for the kids! Merry Christmas!